This 15,000 square km of savannah is probably the most famous of Tanzania’s parks. It Masai Name means ‘Endless Plain’ and it was made a World Heritage Site in 1978. The very mention of the name Serengeti is guaranteed to bring a glint to the eye of even the most experienced Africa traveller. The Serengeti ecosystem supports some of the most plentiful mammal populations remaining anywhere on earth and the animals here always seem bigger, stockier and stronger than elsewhere in Africa. The park has some of the best accommodation available in Tanzania and the quality of service is always excellent. Large herds of wildebeest, hartebeest and elephant can be found in this beautiful baobab tree dotted park that stretches south of Lake Manyara and along the Tarangire River. A great dry season destination, Tarangire is great for spotting gazelles, kudus, giraffes and a whole lot more. Africa’s highest peak, the extinct volcano Kilimanjaro is emblematic of Tanzania and draws travellers from all over the world. Skirted by lush rainforest and Alpine meadows, the mountain and park is home to monkeys, leopards and buffalos, along with a profusion of birdlife for the amateur ornithographer in all of us. Wildlife galore and astonishing vistas. This is one of Africa’s most famous game viewing locations. The steep sided crater keeps a melting pot of wildlife in the relatively small area of 260km2, making it easy to see everything from rhinos and elephants to flamingos and storks. 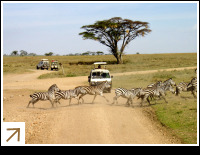 The Ngorongoro Conservation Area is a tantalising microcosm of safari life that is unmissable on any trip to Tanzania. This is one of Tanzania’s smallest but most beautiful national parks. 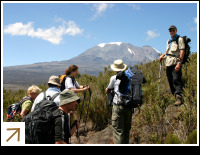 The terrain is varied, consisting of rugged volcanoes and craters as well as lakes and forests and the iconic Mount Meru. Wildlife is prolific and you can spot everything from dik-diks and hyenas to vervets and reedbucks, as well as the more familiar big fauna. Some say the best way to see this park is by canoe. A vast 48,000km2 wilderness game reserve – and Africa’s largest. Despite its size, Selous is not as well known or visited as some of the wildlife reserves in northern Tanzania. Flowing through it all is the mighty Rufiji River, which provides the opportunity to see some of Africa’s most striking water-based wildlife such as crocodiles, and where it mixes with seawater in the delta, dolphins. The reserve is also home to large herds of elephants, as well as hippos and black rhinos, and not forgetting a profusion of birdlife.